For much of my youth, the world's largest shopping center was West Edmonton Mall in Canada. At this juncture in history, China is so superlative that it can only outdo itself though. 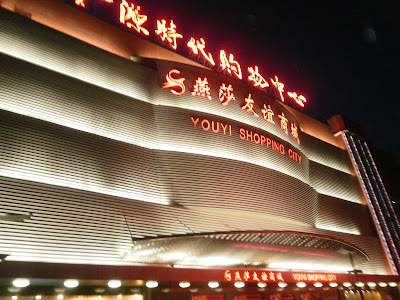 I visited what was once the world's largest shopping mall in Beijing. It has since conceded first place to the deserted South China Mall in Dongguan in 2005. Beijing's Golden Resources Shopping Mall held the title for approximately a year, as it opened in 2004. With narrow corridors and over a thousand stores packed into it, the Great Mall of China does not have any cavernous spaces to invoke a feeling of awe at its size. The design is quite mundane. Six million square feet of gross leasable area are spread across several city blocks. Sky walks over the streets connect the different sections to keep the mall connected as technically one building.